Map of the Arabian Sea. The Arabian Sea is located in the northwestern part of the Indian Ocean, situated between the Arabian Peninsula and the Indian subcontinent. It merges with the Gulf of Oman to the northwest and the Gulf of Aden in the southwest, and spans a total area of 1,491,000 square miles. The depth of the sea varies as it joins the Indian Ocean to the south, but it is generally approximated at 8,970 feet. The Sea provides an important link between the neighboring areas of Iran, the Arabian Peninsula (including Yemen, Oman, United Arab Emirates), Pakistan, the Horn of Africa nations, and India. For this reason it has gained eminence as a vitally important historical trade route. 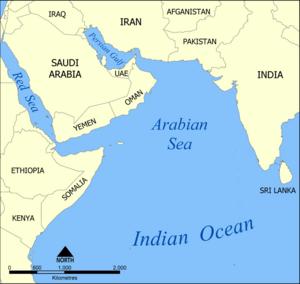 Smaller political areas also fringe the Arabian Sea, including Socotra off the coast of Yemen, the Khuriyya Muriyya islands and the Lakshadweep islands. The Arabian Sea is connected to surrounding bodies of water by a series of gulfs and straits that provide a steady avenue into the sea. The largest and most notable of the gulfs which feed into the sea are the Gulf of Oman, which connects the Arabian Sea to the Persian Gulf and the Gulf of Aden that connects the Arabian Sea to the Red Sea. However, gulfs are not the only access point into the Arabian Sea, as two significant rivers drain into its borders. The Arabian is augmented by water flowing down the Indus and Narmada rivers, which are the principal means of access to the Arabian Sea. The Arabian Sea is distinguished by its remarkably deep water level that is often maintained close to land masses. The deep water level is hypothesized to be one of the reasons that there are no significant island developments in the center of the Arabian Sea, despite the fact that islands are quite proliferate on the outer borders. The Arabian Sea floor, while far below the surface, exhibits a startling complexity akin to standard land formations. Perhaps most notable among the submarine features is the Maldive Ridge, which runs along the ocean floor from the Arabian Sea into the Indian Ocean. This ridge, which is essentially similar to a mountain range on land, eventually rises above the water level to become the Maldive Islands. The Maldive Ridge, along with other sea floor formations in the Arabian Sea, are hypothesized to be the result of seismic activity roughly 50 million years ago. According to geologists, during this time period Asia collided with the subcontinent of India, forming the Arabian Sea and its unique underground ridges. After the initial collision of the two land masses, the Arabian Sea has been shaped by a variety of highly influential factors, including erosion from water currents. One of the deepest areas of the sea floor is where the Indus River meets the Arabian Ocean. In the place where the two bodies of water meet, a sharp canyon has been formed on the sea floor, as the forces of the incoming water sweep away the sandy bottom. Also as a result of this erosion, the Indus River carries the sediment further into the sea, eventually depositing the excess into ridges or other formations. 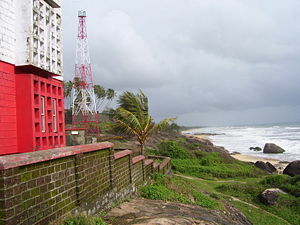 The Arabian Sea contributes to a monsoon climate in the surrounding region by providing the water necessary for the wet storms. 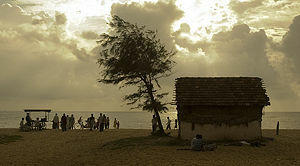 During the monsoon season, winds on the sea generally blow from the southwest and are particularly cold. Winds during that season are actually so strong that they succeed in sweeping away some of the salt content of the upper levels of sea water. During the monsoon season, the upper waters are less then 35 parts per thousand salinity while in the non-monsoon season salinity is over 36 parts per thousand. The change in salinity is attributed to the flow of the wind, which shifts to a northwestern flow when the monsoons are finished. A rich and varied aquatic habitat is supported in the Arabian Sea by high levels of inorganic nutrients. These nutrients, particularly phosphate, occur in the sea as a result of a water currents along the continental shelf that circulate nutrients from the sea floor. The effect of aquatic recirculation is particularly pronounced in the shallower areas of the sea, where light can penetrate the water. Other important natural resources in the region include petroleum and natural gas. The Arabian Sea is also notable for its large population of pelagic fish, or those fish which live near the surface of the water. Many varieties are harvested in small scale fishing operations in the area, including tuna, sardines, bilfish, wahoo, and a variety of sharks. However, while the Arabian Sea hosts large fish populations at the moment, the marine habitat is constantly under threat from periodic mass mortality. Occasionally in the Arabian Sea the fish population falls victim to a particularly strong upsurge of phosphate. When phosphate rises in great quantities, the level of oxygen is dramatically reduced, resulting in mass aquatic mortality. Water transport along the Arabian Sea had been established prior to Roman times, and only grew as time went on. Early trade routes that combined land travel with sections of marine travel were later eschewed to only encompass water transport as the trading lanes became more accessible. The early trade routes that crossed the sea quickly became established in the international trading community, leading many leaders to construct canals in an effort to further trade. Early examples of canal building can be found in the region now covered by the Suez Canal. In their manifestations, however, the shallow canals were particularly unstable and would often be swallowed in sand storms. The Arabian Sea reached a historical heyday in the ninth century C.E., when Arab and Persian seamen began to use the sea as a means of communication with neighboring communities. By mastering the wind currents of the sea, seafarers were able to accurately navigate to southern Arabia, East Africa, and a variety of Red Sea ports. Written documentation exists that gave detailed instructions for sailing on the Arabian Sea, and the routes that had to be followed to arrive successfully at a desired location. These instructions, called rahmangs "book of routes," are a valuable source for analyzing marine knowledge prior to modern times. In more recent history, the John Murray/Mabahiss Expedition of 1933-1934 formed the bulk of modern–day information regarding the sea. Its intricate studies of sea currents, sea floor land formations, and sediment, published over a 30-year period, helped to awaken the modern academic world to the scientific importance of the Arabian Sea. While the Arabian Sea played an historic role in trade, it continues to be a vital area for international shipping today. The Arabian Sea became a major player in the international shipping scene with the construction of the Suez Canal in 1869. While the Suez Canal does not directly enter into the Arabian Sea, its construction allowed for greater marine trade in the area. The Arabian Sea is considered to be one of the world's busiest shipping lanes, primarily due to its proximity to the Red Sea and the Persian Gulf. Most of the ships that use the Arabian Sea for transportation purposes are large tankers, whose travels often conclude in East Asia, Europe or The Americas. The Arabian Sea, due its seasonal weather fluctuations, offers excellent examples of biological adaptation to environment. However, the diverse aquatic habitat is currently under threat from the oil industry, which uses the sea as a shipping lane. Oil spills, anchor damage, and sedimentation are constant threats in the region. The sea environment is also harmed by mechanized fishing practices, including the use of dynamite, that cause the ecosystem to become unstable. Currently, plans are being considered that would protect the delicate wildlife of the Arabian Sea, particularly the turtle and coral populations. However, in order to implement a conservation program in the region, a wide variety of nations must multilaterally agree to take steps towards preservation. Encyclopedia Britannica. Arabian Sea Retrieved November 19, 2007. World Wildlife Fund. Arabian Sea - A Global Ecoregion Retrieved November 24, 2007. Encyclopedia of the Orient. Arabian Sea Retrieved November 26, 2007. This page was last modified on 11 April 2016, at 15:24.